‡ Star - A star emits light as a result of the nuclear 'burning' within it's interior. ‡ Electromagnetic Spectrum (EM) - The EM spectrum's full range includes, Radio, Microwave, Infrared, Visible, Ultraviolet, X-rays and Gamma-rays. While it may not seem so, each of these forms of radiated energy are basically the same - streams of emitted photons. While the conditions that create each are different, they all occupy a specific "band" along a line that varies according to the wavelength of each type. ‡ Star Classification - Stellar classification is a classification of stars based initially on photospheric temperature and its associated spectral characteristics (elements that they absorb), and subsequently refined in terms of other characteristics. ‡ Hydrogen Fusion - Fusion in a star is the process of light nuclei combining to form heavier nuclei. For elements lighter than iron, this process liberates energy. The fusion of elements heavier than iron takes energy rather than gives energy. Stars are therefore powered by the fusion of elements lighter than iron, particularly of hydrogen. ‡ Planetary Nebula - A shell of stellar gas and debris ejected from stars like our Sun at the end of their lifetime. ‡ Supernova - A themonuclear stellar explosion of cataclysmic force. Extremely luminous and sometimes visible across the entire universe a supernova causes a burst of radiation that can briefly become more luminous than an entire galaxy. ‡ Extrasolar Planet - An extrasolar planet is a planet beyond the Solar System which is orbiting around it's own star or sun. The search for these types of stellar objects are currently seeing widespread scientific research and investigation in that they are prime candidates in the quest for earth-type planets. 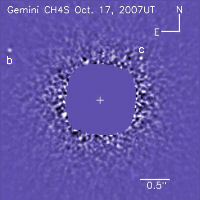 See The Extrasolar Planets Encyclopaedia which lists all extrasolar discoveries to date. Stellar evolution is the process by which a star undergoes a sequence of radical changes during its lifetime. Depending on the mass of the star, this lifetime ranges from a few million years (for the most massive) to trillions of years (for the less massive), considerably more than the age of the universe. In this section you'll follow the beginning and end of a star's life, a journey across a billion or more years; a journey of diverse and complex variety whose very numbers stagger the imagination, rivaling even the grains of sand. You will learn that the makeup of some stars are a result of their birth, some a product of their age, others are the results of their physical makeup. Some are amazing in and of themselves and others due to their affect on other stellar objects or even upon the universe itself! Some stars have remained elusive while others have only recently been shown to exist. Some stars are stillborn while others end their lives in a mighty crescendo heard and seen across the universe, throwing out the stellar matter that comprises the very ingredients that make up our own galaxy, our own world and even ourselves. Stars can be as near to us our own sun, a mere eight light-minutes away or as far off as SN1997ff, a star gone supernova and located 11 billion light-years from Earth. 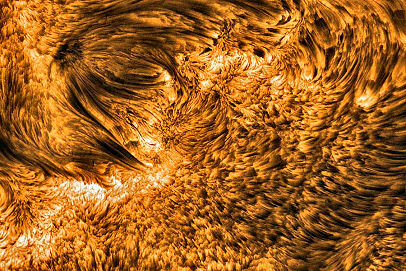 Seen above is perhaps the highest resolution image yet of the surface of our own sun and it's solar flux tubes. Image Credit: APOD Seen below and photographed about eight days after it exploded, Supernova 1997ff (SN1997ff) was found by astronomers comparing the northern Hubble Deep Field, a 10-day observation of a tiny region of sky first explored by the Hubble Space Telescope in 1995, with a follow-up observation in 1997. As the the year changes we are finding and imaging an ever incresing number of new stars, including a handful that have other stellar planets which orbit them. These planets, known as Extrasolar Planets may contain more than just the reflected light from their own sun. Each page begins with a short list of terms and definitions you should know and that are relevant to that particular section's star type. Throughout each page information is referenced via the originating URL with all images linked and credited to their respective owners. Additional information that may be of interest can be found on the left side menu or at the end of each page entitled 'For Further Study'. Finally, at the end of each category (galaxies, nebula etc) you will usually find a link to a single study or interest page containing different historical trivia, astronomy facts, interactive science, study topic of the month and more.